Thailand's foreign minister on Friday urged regional nations to redouble efforts to tackle the causes of this year's Bay of Bengal migrant crisis, warning the issue "will not simply go away". Delegations from across Southeast Asia met in Bangkok for talks over migration, six months after a belated Thai crackdown on human trafficking gangs saw thousands of migrants from Myanmar and Bangladesh abandoned at sea. The summit came as boats crammed with migrants traditionally depart following the end of the monsoon season around November. Horror stories of kidnap, coercion and hunger emerged from the hundreds who staggered ashore or were eventually rescued by Thai, Indonesian and Malaysian authorities after weeks at sea following the crackdown in May. Thai authorities acted after dozens of skeletons of migrants were found in jungle camps on the border with Malaysia -- grisly evidence of a trafficking trail that reached from Myanmar and Bangladesh southwards through the Indian Ocean. The kingdom has arrested scores of people, including a senior army general and high-ranking civilian officials, for their alleged roles in conducting the multi-million dollar annual trade in humans through Thailand. "This problem is not a short-lived one. It will not simply go away," Foreign Minister Don Pramudwinai said in his opening address. 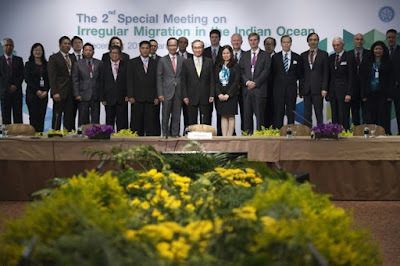 Warning that the monsoon season is ending he said: "It is very likely that maritime movements in the Indian Ocean will soon begin again... we need to continue to work together towards a truly comprehensive and sustainable solution." At the height of the crisis, Thai authorities called for "root causes" of the migration to be addressed. The migrants escape poverty in Bangladesh, and Myanmar, mainly from the Rohingya Muslim minority which lives in apartheid-like conditions in western Rakhine State. A senior official from the UN's refugee agency praised Bangladesh for working towards regularising some migration from its shores since the crisis spooled out. But he was scathing of Myanmar which denies most Rohingya citizenship, the right to vote and erects a host of other barriers. "The heart of the matter lies in ensuring a legal identity for all people on its territory and the ensuing fundamental freedoms, such as freedom of movement, non-discrimination and access to services," said Volker Turk, the UNHCR's Assistant High Commissioner for Protection. As the annual monsoon ebbs over the Bay of Bengal it is unclear if people will take to boats in the same numbers as previous years. With trafficking networks under the cosh in Bangladesh, Myanmar and key transit point Thailand, some analysts of the trade expect fewer boats to make the treacherous journey south. Chris Lewa, from the Arakan Project, which monitors migrant journeys across the Bay of Bengal, said in October last year around 13,000 people left. In October 2015 she counted just 800 in five boats. "In southern Bangladesh, police are continuing their search for smugglers. They have a long list (of names) so it has disrupted everything," she told AFP earlier this week. "The boats are also no longer passing through Thailand. It seems that all the boats so far are landing directly in Malaysia. Everything has changed up," since the crackdown, she added.